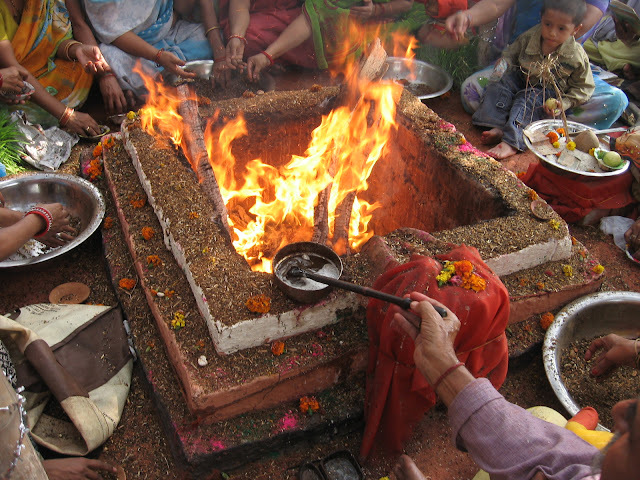 Yajna is the central concept of Srauta -- the tradition that follows from the Śruti (Veda). Karma mārga is based on the concept of Dharma. The result of an action performed is determined by the Dharmic or adharmic nature of the action. Dharma determines the fruit of karma and karma determines the course of experience of beings. Karma Mīmāmsa the base text for Karma Mīmāmsa, opens up by saying "athāto dharma jijñāsa", to expound the nature of Dharma. 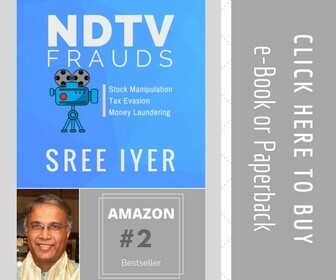 The text clearly states that karma and its results are based on Dharma - "Dharma mātre tu karmasyād nivṛtteḥ prayājavat". In karma mārga, mukti is possible through karma nivṛtti, through the performance of righteous karma. Being action-centric does not make yajña any more outward or superficial compared to Upāsana mārga. For instance, Baudhayana's "nā rudro rudram arcayet" (one who is not Rudra cannot worship Rudra - meaning one becomes or unites with Rudra in order to worship Him, by invoking Him) is interpreted differently in Karma and Upāsana mārgas. Upāsana, the state of union of the seeker and Rudra is primary, while the act of worship is secondary. In karma, the union is taken to be implicit, and the act of Rudra worshiping Himself becomes primary. 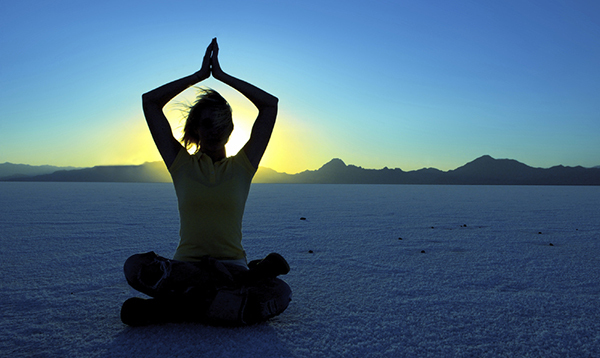 There are two directions of movement or phases in life, pravṛtti and nivṛtti. Pravṛtti is accumulating and indulging. Nivṛtti is clearing debts and transcending. In pravṛtti, yajña brings material possessions, righteousness and heavenly bliss. This helps man fulfill his aspirations as well as contribute to social living. Man gradually grows beyond desires and becomes more impersonal. This is how he enters the nivṛtti phase. During nivṛtti, yajña is done without any desire, merely as a duty. This helps in clearing past karma, but this greatly helps the well-being of surroundings (loka kalyāṇa). This is the way the realized soul performs yajña. This is the niṣkāma karma explained in the Karma Yoga of Bhagavad Gīta. In nivṛtti, yajña brings eternal bliss. Brahmandavalli of the Taittirīya Upanishad expounds the gradation of happiness experienced by men, manes, Devatas, lord of Devatas, teacher of the Devatas, creator of Devatas and the creator of the universe in the ascending order, increasing hundred fold for each level. At each level, the bliss is equated to that of a veda-wise person (Śrotriya) who overcame his desire (kāma hatasya). 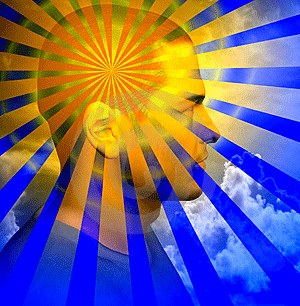 In pravṛtti one experiences the bliss of Devatas. In nivṛtti one grows beyond desires and experiences the bliss of Brahman. In nivṛtti, yajña brings liberation. 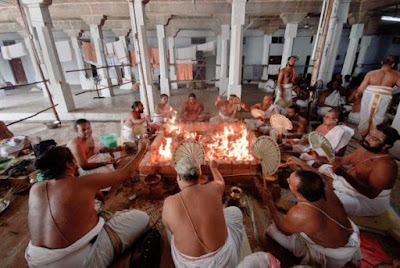 Vedic injunctions that make the rites mandatory. as heaven, prosperity in the next life or breaking the cycle of life itself) are called āmuṣmika. The rites that give both kinds of results are called aihika-āmuṣmika. Agni karya forms the core of a sacrifice. It includes purification rites and the homas. The ingredients used in a yajña are called dravya. 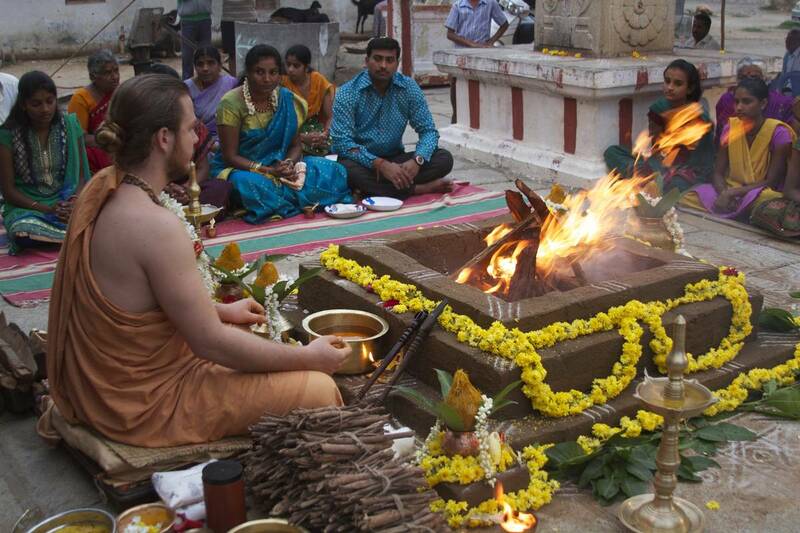 There are six ingradients involved in performing an Agni Karya. In major yāgas, there are at least four rtviks involved. 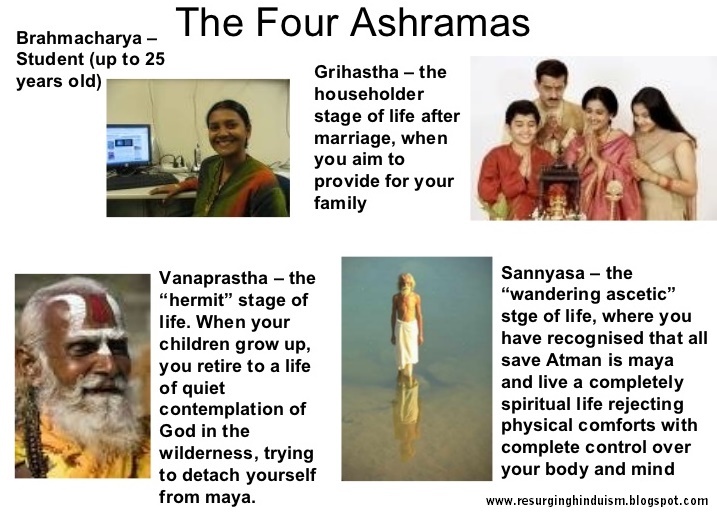 They are hota, adhvaryu, brahma and udgāta. Hota should be learned in Rig Veda, and chants the Ṛks. Ādhvaryu is the one who performs the sacrifice (makes the yajamāni do it with instructions). He should be learned in Yajurveda. Udgāta sings the Sāma Veda. 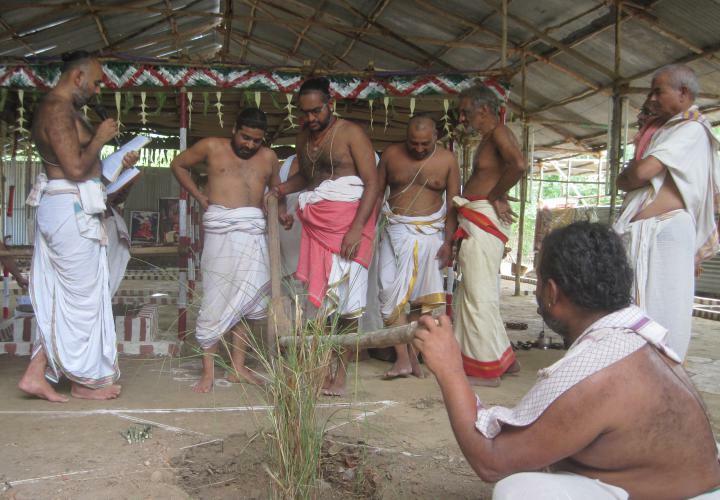 Brahma supervises the sacrifice. Yāga sāla follows a specific architecture/layout. It has four entrances, representing the four Vedas. The four entrances have four gates, decorated with the leaves of four kinds of trees, or rather named after the four trees. They are Nyagrodha, Aswattha, Audumbara and Plaksha. In the four directions altars are built in shapes specified against those positions (they could be circular, square or following any other geometry according to the Śrauta Śūtras). The eight Dikpālakas preside over the eight (four directions and four corners) positions of the yāga sāla. 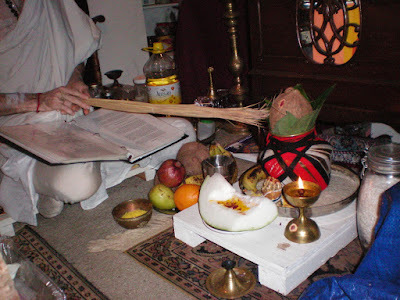 Homas are performed in those designated places to the corresponding devatas, according to the rites of the respective Vedas. 1. Samrādasi Kṛuśānū, positioned at the secondary altar in the north. This is the Āhavanīyā Agni. 5. Ṛtadhāmāsi Suvarjyoti, positioned at Audumbara (the ṛtvija who chants the Sāma Veda). 7. Ajosyekapāt, positioned at the sukhaśāla. This is the Gārhapatya. 8. Ahirasi budhniya, positioned with the Yajamāni. Seven are paka Yajñas (aṣtaka, sthālipāka, parvana, srāvaṇi, āgrahayani, caitri and āsvīyuji). They involve consecrating cooked items. Soma Yajña. Others are usually referred to as haviryañnas. niruudha paśu bandha, sautrāmaṇi). They involve offering havis. snātaka and vivāha. These are specified by the gṛhya sūtrās. specific vegetables in particular. However this has exceptions. Dīkṣās like Manḍala Dīkṣa or Cāturmāsya. 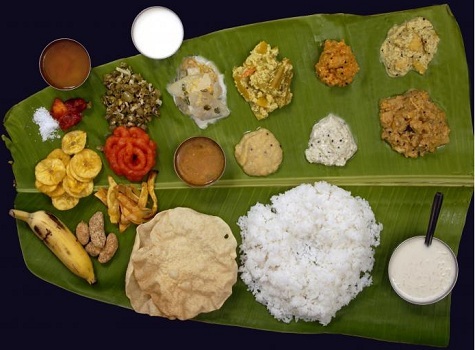 cooked with specific ingredients to the like of the Devata. The same is consecrated and consumed. Vedic injunctions regarding sacrifices, such as “saptadasa prājāpatyān paśūn ālabhet” are explicit in their message. However, such injunctions are interpreted in different ways. One of them is the symbolic interpretation of “paśu” as the one that is bound by pāśa (binding), and making sacrifice symbolic. The other is the literal interpretation, where a symbolic bali (piṣṭa paśu) is offered. 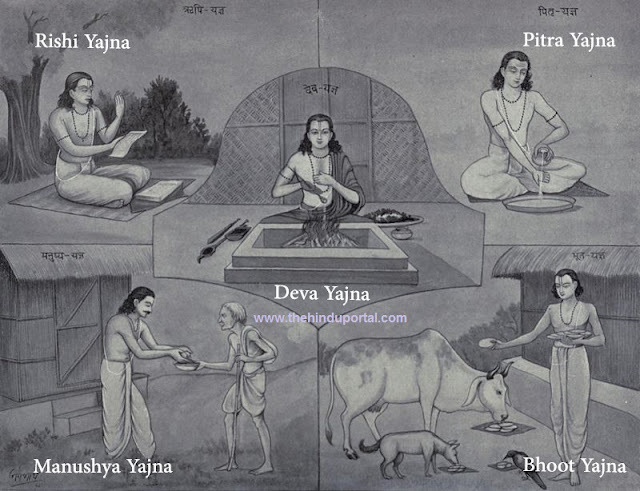 The history of yajña shows that Yajñas rarely involved animal sacrifices and that they were always a matter of inconvenience to the Vedic seers. There is a story in the Purāṇa that tells how animal sacrifice is made redundant in yajñas. The ṛṣis had an argument with the Devatas that they would offer only symbolic sacrifice and not animals. The Devatas did not like it. Ṛṣis mandated that animals will not be offered in yajña, and king Vasu conducted a sacrifice by inviting the ṛṣis as ṛtviks for the sacrifice, in which he made only symbolic sacrifices, and mandated that Devatas should not make it obligatory for yajñas to involve animal sacrifices. Appreciative of this, the ṛṣis mandated that in every sacrifice the havis after pūrṇāhuti should go to Vasu. To this day major sacrifices involve havis to Vasu starting with the mantra “Vasordhāra juhoti”. 1. 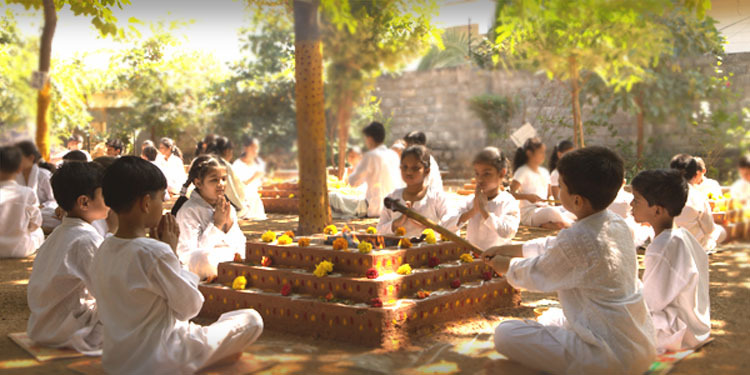 In brahmacarya, the principal rite to be performed is svadhyaya - Vedic learning. 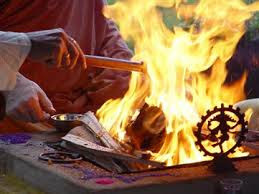 This is apart from other rites like daily oblations to Agni and service of Guru. 2. In grhastha ashrama, one should perform the panca maha yajñas (or nitya karma astaka as the school may be). Along with these, his family and social responsibility as the smriti prescribes, form part of his main rites in grhastha ashrama. 3. 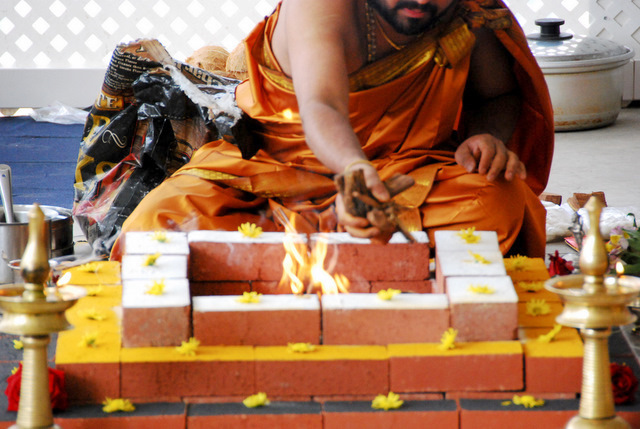 In vānaprastha, many of the rites of grhastha ashrama become optional and even unnecessary. Nitya and naimittika karmas should be performed. Raising children as an injunction is no longer relevant here. However pitru tarpana is still done during vānaprastha. Teaching should be done. 4. In sanyāsa, there is no compulsion on karma, though minimal nitya karma is performed. A sanyāsi also undertakes naimittika rites such as Caturmasya (four-month austerity undertaken in a year). Even teaching is optional for him. This is called deva yajña. 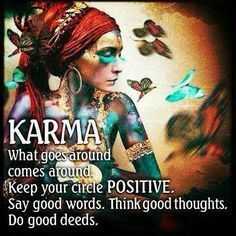 The widest application has been the karma concept in life. Many of the ideals seen today in learnedmen, such as being righteous, maintaining a moral code, doing actions without being particular about results, not harming anyone unnecessarily, being content and not greedy, fulfilling desires in a righteous way, keeping righteousness above desires, and doing every action as a sacrifice, follow directly from yajnic principles. Leading a life with these ideals is treated as equal to living a yaajnic life, and causing liberation through karma nivṛtti. The karma yoga that many of the men live (though they are not into the path of worship) is a reflection of the yajnic ideal in their lives. Jnana Marga is expounded in Vedānta and thus, Vedanta treats yajna/karma to be a means of purification, a preparation for acquiring jnāna. Beyond that, in jnāna mārga, spiritual knowledge is the means of liberation, and not worship. 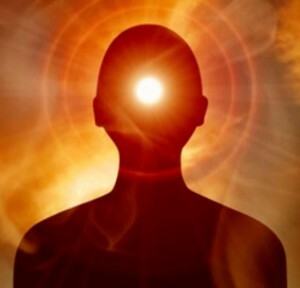 The different categories of yajña, such as vedic ritual, the subtle body yogas such as mantra yoga and kundalini yoga are acknowledged in jnāna mārga as means to attain the necessary state for pursuing the path of knowledge. acquiring jnāna. In jnāna mārga, liberation is possible only through jnāna. In fact the self is always liberated, and the state of liberation for a being is the knowledge of difference between self and non-self (ātma-anātma vivecana). Karma purifies and prepares the being for the state of knowledge/discrimination.